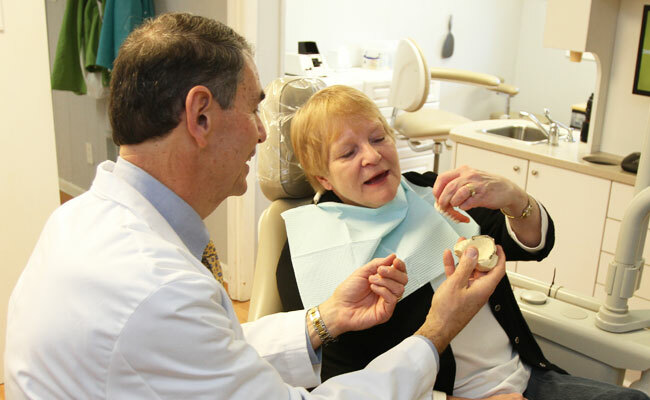 Implant-Supported Dentures solve the problems associated with wearing dentures. Over time, people can develop problems with dentures. The dentures can become painful or tend to move around. Dr. Charles Flowers can prevent these problems by making you a customized set of dentures that will not slip and slide. They are attached to and supported by dental implants. With implant-supported dentures you will get much greater stability. That means no slippage, greater comfort and the ability to chew what you want. 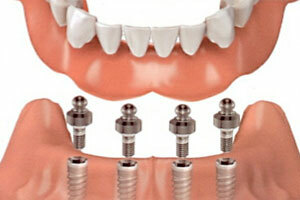 The more dental implants used, the greater the stability and the better the look and feel. Implant-supported dentures also offer the advantage of eliminating the need for messy denture adhesives. An implant-supported denture is attached to implants placed in the jawbone and is removable. This type of denture fits over a bar or ball and socket and is then securely clipped into place by the attachments. A denture can be supported with just two dental implants in an arch. With six to eight implants, the need for the pink plastic sides is eliminated and your teeth will emerge from the gum like natural teeth. Implant-supported dentures are also an option for a patient who is having his or her teeth extracted, and are a lot more affordable than full dental implants. Dr. Flowers is highly trained and very experienced in the placement of implants. Over the years, he has successfully performed several thousand implant procedures.